According to experts on the issue, the reason for Chinese presence in Pakistan – in particular in occupied Gilgit-Baltistan – is twofold: to counter US influence in the region, and to combat Muslim ‘separatists’ directly on the ground. China is establishing some military bases in Gilgit-Baltistan, a territory whose sovereignty is much disputed. Tragically, the Pakistani authorities reap short-term benefits from the illegal military and economic involvement of China in Gilgit-Baltistan, a situation which contributes to the state’s security forces being able to commit human rights violations on a massive scale without impunity. To make things worse, the efforts of NGOs, scholars and Members of the European Parliament to denounce the exploitation of local resources, the use of the Anti-Terrorism Act to randomly arrest people and the attempt to wipe out the Baloch identity are systematically silenced by Islamabad’s security agencies. China has entered in Gilgit-Baltistan (GB), under the illegal occupation of Pakistan, with a well-conceived two-prong plan to keep its military presence in Pakistan to counter US existence there, under the garb of strategic China-Pakistan Economic Corridor (CPEC) worth of $ 46 billion dollars’ project. In similar fashion, as US military presence is in Pakistan, China too wanted its military existence to counter effectively the Muslim separatists, operating from the tribal areas of Pakistan for almost a decade carrying out cross-border activities in trouble-torn Xinjiang, an autonomous region in China. Beijing is setting up its Military Bases either in FATA (Federally Administered Tribal Areas) or the Northern Areas (Gilgit-Baltistan). In exchange of this strategic plan Pakistan wanted China to Build a Naval Base at Gwadar in Baluchistan with a definite design. China is well aware of the fact that Gilgit-Baltistan is in political and diplomatic dispute and that Pakistan’s sovereignty does not extend to this region. Even though China knows that Pakistan’s constitution and the Supreme Court of Pakistan or other federal government institutions do not have jurisdiction in Gilgit-Baltistan, China wanted with firm strategy to establish trading routes to Iran and the Middle Eastern countries. Both China and Pakistan have crushed the legitimate concerns raised by the people in GB while violating their human rights to achieve the CPEC objectives. The locals here feel Pakistan and China are exploiting their resources. Several local NGO delegations and intellectuals who study the region are constantly voicing these concerns in the United Nation Human Right Sessions. India has repeatedly underlined its claim over Gilgit and Baltistan (GB) territories of Jammu and Kashmir, under illegal occupation of Pakistan. Pakistan with heavy hands is trying to silence the voice of social, political leaders and media who are hell bent to make GB an independent region. Security agencies have been given powers under the National Action Plan (NAP) to keep people in check. Anyone who criticises even a little is booked under the Anti-Terrorism Act. According to a report, hundreds of youths and political activists have allegedly been put behind bars under this law. Human Rights Commission of Pakistan (HRCP) in its latest report on Gilgit-Baltistan has demanded the government to stop security agencies from allegedly exploiting anti-terrorism laws against youths and political activists. Former HRCP chief Asma Jahangir, who released the findings of the report in Islamabad, asked the federal government to empower democratic forums of Gilgit-Baltistan, appoint judges from among the locals and address the issues of internally displaced persons (IDPs). According to Senge H. Sering, a scholar from Gilgit-Baltistan based in Washington DC, “China has a huge and long-term presence in Gilgit-Baltistan and is building extensive roads, bridges and telecom networks to sustain it. The drives compelling China to develop Karakoram Corridor are diverse and mainly pertain to its economic, strategic and political ambitions.” There is military component to this much-touted economic development project as there is a construction of an army headquarters in GB region for the security of the CPEC. Various political and human right organizations have expressed their concern over the silent invasion of China. So much so, Pakistan has further complicated the situation by increasing the percentage of Sunni population over pre-dominantly Shia region. In a very subtle move, Pakistan has been trying to declare GB its new province. But its move has vehemently been opposed by India as well as by the separatists operating in Jammu Kashmir state. On March 23, 2017, the British Parliament condemned Pakistan with regards to the plans to declare Gilgit-Baltistan as its fifth Province. 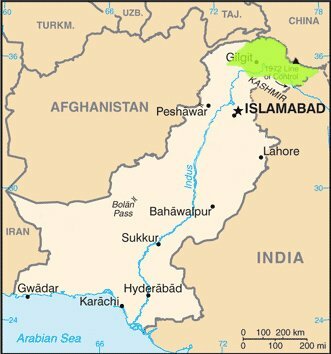 The motion says “Gilgit-Baltistan is a legal and constitutional part of the state of Jammu & Kashmir, India, which is illegally occupied by Pakistan since 1947.” The motion further claims that attempts to change the demography of the region was in violation of State Subject Ordinance and that the ‘forced and illegal construction’ of the China-Pakistan Economic Corridor (CPEC) further interfered with the disputed territory. Conservative Party leader Bob Blackman tabled the motion. It is on record that China in its own confirmation letter to UN in 1963 has endorsed Gilgit-Baltistan as a disputed land when General Ayub Khan the Military Dictator had ceded about 7000 Sq. Km area of Shimashal Hunza, Gilgit to China as the price for the construction of Karakorum Highway (KKH). In a letter, China has also mentioned that after the establishment of a sovereign authority in GB, following a resolution of Jammu & Kashmir issue it will re-negotiate with the sovereign Authority to settle the Shimashal occupation. Members of the European Parliament (MEP) in a conference titled ‘Opposition against CPEC in Pakistan held at the European Parliament in Brussels on March 1, 2017, highlighted the fact that the projects under the CPEC were being built largely against the will of the locals of Baluchistan, Sindh and Gilgit-Baltistan. The speakers said that on the pretext of the CPEC, there was a deliberate move by the Pakistan to re-settle Punjabis and Chinese nationals in the region, thus attempting to dilute and eventually wipe-out the Baloch identity as well. Wajahat Hassan, Head of the Gilgit-Baltistan Thinkers Forum (a GB leader-in-exile) while expressing grave concern over the cases of human rights violations in Gilgit-Baltistan, accused Islamabad of allowing foreign countries, particularly China, to exploit the resources of the region. He also stated that the Pakistani government had initiated a process of altering the demography of Gilgit Baltistan, with the objective to increase its influence. In same tone and tenor Balouch representative Mehran Baloch opined that the construction of the CPEC in Baluchistan and Gilgit-Baltistan was illegal, as Baluchistan was territory occupied by Pakistan and Gilgit-Baltistan was disputed territory, even as per Pakistan’s Constitution. Alberto Cirio, MEP, described the CPEC as a project in which, under the pretext of ‘development’, the State was indulging in corrupt practices for short-term gains, even at the cost of human rights violations against the people of Gilgit-Baltistan and Baluchistan. He also expressed concern about the charter of the Special Security Division (SSD), apparently set up to protect Chinese workers in Pakistan. He stated that the number of personnel in the SSD was higher than the number of Chinese workers in Pakistan, indicating that it would probably be used for other purposes, including suppressing of the locals.